GDP per capita is calculated by dividing GDP by midyear population. GDP is the total market value of all final goods and services produced in a country in a given year. In Nominal method, market exchange rates are used for conversion. As of 2018, Luxembourg is the richest country of the world having GDP (nominal) per capita around of 113,954 current USD that is over 10 times to the world's average of $11,368 and over 371 times of lowest ranked South Sudan of US$307. Luxembourg is followed by Switzerland ($83,583) and Norway ($82,372). There are 16 economies which have per capita income above $50,000, 44 have above $20,000 and 71 has above $10,000 at exchange rate basis. 65 countries have per capita income greater than global average. 28 economies have less than $1,000. 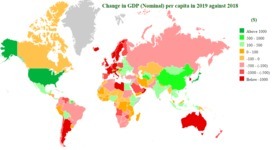 Top Gainers in 2018: GDP per capita of world has increased by 519 US dollar in 2018 at current prices. Luxembourg is top gainer in per capita income as its added $8,091 more in 2018. Norway, Qatar, Ireland, and Brunei Darussalam are other top gainers. Top Losers in 2018: At current prices, Out of 192 economies estimated by IMF, GDP per capita of 18 economies have decreased in 2018. Argentina is biggest loser as its gdp per capita figure has declined by $3,797. Argentina is followed by Venezuela which has also lost more than US$3,000. 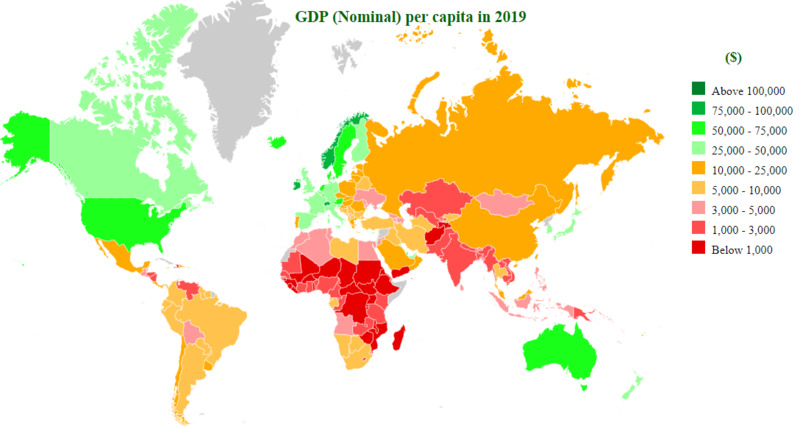 Turkey and Dominica are among top four economies having per capita income down by over 1,000 USD compare to previous year. Changes in rank: Libya is the highest gainer in World GDP (nominal) per capita Ranking. Libya moves 14 positions up in ranking followed by Algeria and Mongolia that moved up by 8 positions each. After losing more than 50% of its income, rank of Venezuela is down by 43 position. Other top losers are : Sudan (-14), Angola (-12), Argentina (-11) and Turkey (-10).